drive disc jockey (Don Daro) at the #1 radio station (KMEO AM/FM) in Phoenix, AZ. It didn't begin as a hobby but was rather intended as a vehicle by which Don hoped to buy a radio station of his own. In the late 1990's Don and a well-known rock singer nearly purchased a 50,000 - watt AM station in Los Angeles for $250,000. The performer's manager backed out. The station later sold (1-20-06) for $43 million. Don's mechanical background came from building hotrods in the late '50's and early '60's. Such as dropping V8's in Model 'A' Fords. In 1966 he graduated from the Don Martin School of Radio and Television Broadcasting Arts and Sciences in Hollywood with an FCC First Class Radio and Television license. He then engineered at numerous radio stations to provide his electronics background. The fact that he was pioneering a new industry (that of reconditioning jukeboxes for sale to homes) brought international attention to the fledging company. Hundreds of articles and numerous TV interviews followed. From the start, Don wrote, produced and performed his own commercials for radio and TV. What started in his Phoenix living room quickly expanded to bigger and better stores as well as repair facilities as the years went on. … and much more to list. As word of this unique business echoed around the country via articles and features in print and on TV, other enterprising folks opened stores of their own. The phenomenon had begun to spread. All the networks had already featured Don and his business, which was then picked up by the wire services and thus newspapers all over the world. But before it really caught on and jukebox operators were still naive as to the value of their old equipment, Don would contact several of them over the phone. He would learn what 'goodies' they had and negotiate prices. Then he'd arrange to go get them. speakers and destroy the cabinets. In Los Angeles an old operator told how he used to haul complete 1946 "1015" Wurlitzers up to Mulholland Drive (the mountain dividing Los Angeles and San Fernando Valley) and push them off into the canyons. The 1949 Seeburg 100 selection jukebox made all other brands obsolete since they played no more than 40 selections. Operators who had economical warehouse space tended to hang on to the "prettier" models rather than toss them out. Yet they still didn't know what they were going to do with them in the future. Then Don came along and offered to "clean out" their entire building for cash. In the early days (1971-1975) he'd by a 1953 Seeburg "C" for around $5 to $7 dollars or a Wurlitzer 1080 for $125. So for $800 to $2000, he would fill a 40-foot semi while freeing up operator's buildings. Don learned early on that when a unit was heavier than the others, it was probably full of money. Often times it was silver! The first large buy of items was from Prescott Music in Prescott, AZ. Most were '40's and '50's AMIs with a few Wurlitzers from the '40's. 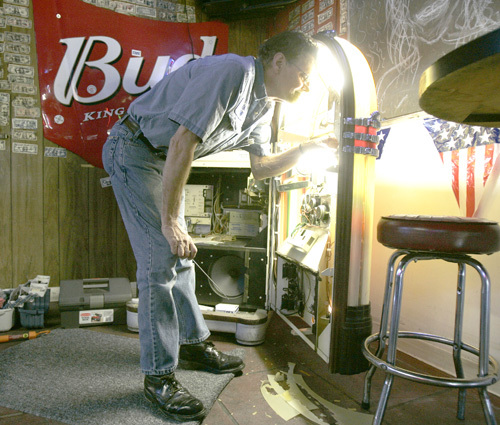 After getting back to Phoenix, Don discovered an "Out of Order" note taped over the coin slot of a 1946 Seeburg "Trashcan" jukebox. When he removed it he realized it was written on a café receipt for a 5-cent cup of coffee and dated 1953. Upon opening the front door the cause of the problem was obvious. The entire coin chute was full of silver. The best part was that the jukebox had been setting "unused" since 1953. It was like new. That operator agreed to selling Don all his old stuff as long as Don hauled away all the old 45's and spare parts. The jukeboxes and slot machines were stored for years right under the Palace Hotel across from the town center. Another time in Gallup, NM the operator made Don's guys also take the stupid gumball machines stored in an abandoned meat locker. He had acquired them when he bought the route. Yet the interesting part was that they weren't full of gumballs, but polished agate key chains. Don's guys soon learned that the ones empty of agate were instead full of quarters. This same operator insisted that Don also take a few hundred chrome Seeburg 3W1 wall boxes. Don had no idea what he would do with them and left without them. As he and his crew sat having dinner at a diner on the outskirts of town a truck with its headlights aiming high came down the highway and pulled in to the parking lot next to one of Don's trucks. When Don got out to the parking lot later he found that the operator had filled his truck with the wall boxes. Eventually Ed in the shop came up with the idea of converting them into lighted telephone directories with 110 - volt ac transformers. for $125 with a year warranty. One day in 1972 a wealthy doctor called Don to ask what the balance was on the jukebox his 15 - year - old son had just bought for $125. When Don explained it was paid in full the doctor invited him to his home where upon the doctor handed Don a check for $1,000,000 to be a 49% partner along with 3 other doctors. Don declined. By 1975 JUKEBOXES UNLIMITED ® had expanded to include a large retail store in a major shopping center, as well as a 5,000 square foot shop where 5 mechanics rebuilt "Anything that takes your money". In 1976, Don looked to move the operation to where folks had more "disposable income". His research shown the residents of fashionable Brentwood (near Santa Monica) CA to be a perfect fit. 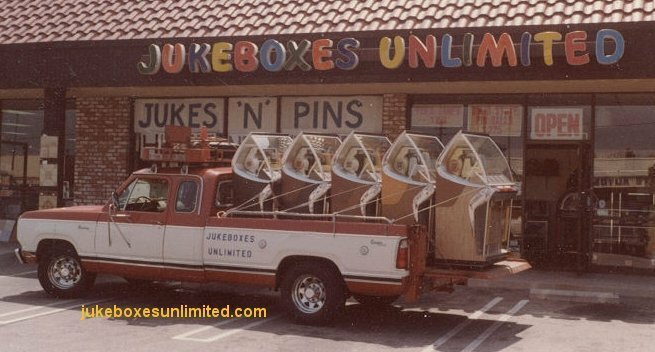 In September of 1977 JUKEBOXES UNLIMITED ® opened its first store in the Los Angeles area. he’d meet the mechanics at the shop to quality check what they had rebuilt the previous week. Together they'd finish the products and load up the 1964 FORD F-100. Then Sunday afternoon Don would head back to LA loaded with goodies for the West LA store. Eventually a 50,000 square foot refurbishing facility was setup in Ladera Heights, near LA, and all operations in Phoenix were closed down. Sadly, none of the mechanics wanted to relocate to the "rat race" of LA. Yet one of Don's neighbors decided to move his family as did Don. at $1.25 per hour in 1971. The mechanics in LA started at $9.00 in 1977.
jukebox as well as other electro-mechanical repairing. from a competitor only 6 months prior. Don Henley, Glenn Frey, Mick Fleetwood, and Lindsey Buckingham were just a few of the early customers. Soon after, Steve Martin, Doc Demento, Dean Torrance, Dave Mason, Bill Bixby and many other entertainers learned about JUKEBOXES UNLIMITED ® 's nifty items. One day Johnny Carson walked into the store and pulled a folded up JUKEBOXES UNLIMITED ® coupon ad from his wallet. It was 2 years old and referred to a Seeburg 3w1 wall box that the shop converted to telephone directories. There was one left. He bought it. say this was a wonderful time for JUKEBOXES UNLIMITED ®. In 1978 there were 18 stores selling jukeboxes in the LA area and Don told his wife he'd put them all out of business. At one point he hired away all the mechanics from a competitor. Then as he prepared to eliminate the last remaining store, G.A.M.E.S., it closed down. Don will tell you two things helped his company succeed then as it does today. One is extensive knowledge of the product and the other is a "fun" attitude. Don always jokes with his customers. He says it makes them laugh and feel more comfortable. cents to 13 cents a square foot and the Wilshire store was now at $2. display ads placed under the heading of "PHONOGRAPHS COIN - OPERATED" in the Yellow Pages. He deemed it misrepresentative since he set his jukeboxes on 'free play' for homes. At the end of 1979 he got a call from PacBell headquarters in San Francisco telling him that the new 1980 phone book for Los Angeles would be their first two part book and that for the first time a slang word (JUKEBOXES) would be used as a new heading. PacBell said the rest of the country would soon follow. In 1980 Don decided to relocated to well known Sepulveda Blvd. in Van Nuys in the San Fernando Valley of Los Angeles. Space was only 65 cents a foot and once again the shop and store were combined. This combining of facilities was what Don preferred. This way a potential customer could be walked back thru the shop to see how things were rebuilt. At this time JUKEBOXES UNLIMITED ® was contacted by Sega Corporation of Japan to sell their retired jukeboxes. They were the largest jukebox operator in the world and had 100 mechanics working around the clock refurbishing machines exclusively for JUKEBOXES UNLIMITED ®. Machines were completely rebuilt by SEGA Japan's mechanics, prepared for shipment, placed on a pallet and loaded in containers to be shipped to the USA. The total cost per box to JUKEBOXES UNLIMITED ® was amazingly low and profits soared. During the early '80's JUKEBOXES UNLIMITED ® might have been the largest jukebox retailer in the world selling 850 to 900 units (mostly to homes) each year. Once again Don wrote and ran innovative TV and print advertising campaigns that brought in thousands of customers from all over the state. In September of 1980 Don purchased the entire parts department of the J.P. Seeburg Sales Corporation (Seeburg Jukebox Company or SMC Seeburg Manufacturing Company), 1500 N. Dayton, Chicago. (See story in the "In the news" section of this site). At the end of 1984 Don decided to close the last retail store and devote more time to developing jukebox party rentals. Thus JUKEBOXES FOR RENT ® was formed. The story of the company's years following will eventually be compiled. Stay tuned.